Four bedroomed Villa Onluk offers an upscale home-from-home experience with a splash of luxury. 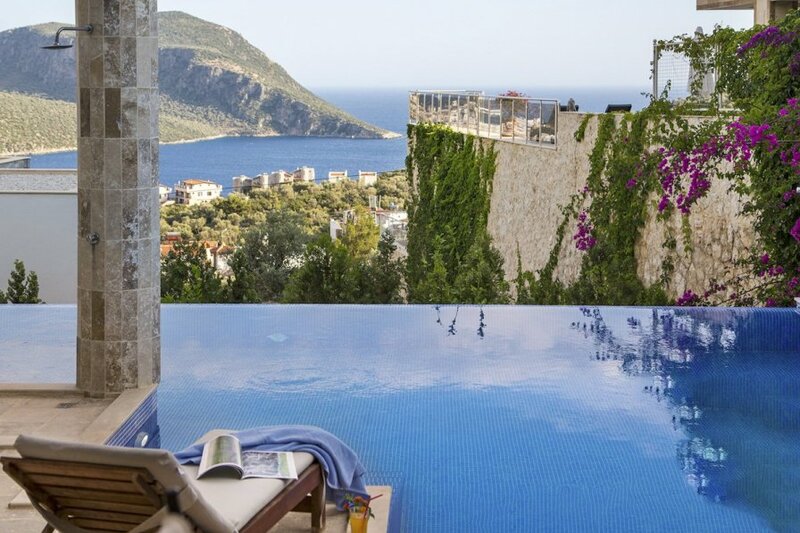 It's located in picturesque Kalamar, a beautiful area of Kalkan on Turkey's turquoise coast. Four bedroomed Villa Onluk offers an upscale home-from-home experience with a splash of luxury. It's located in picturesque Kalamar, a beautiful area of Kalkan on Turkey's turquoise coast, and boasts panoramic sea views. With two Jacuzzi bathtubs, a large infinity swimming pool that looks like it spills into the sparkling sea and landscaped grounds surrounded by trees, it's Turkey at its finest. Upon entering the villa, you are instantly presented with spectacular sea views framed in the large floor-to-ceiling windows and sliding doors. Perfect for families or small groups, there's a luxurious and comfortable lounge with a fully-equipped open-plan living and kitchen room and plenty of places to sit. In the morning, plan your daily excursions over the marble breakfast bar and by night relax in the sumptuous sofas. Think sleek lines, a light colour palate and clean minimalist decor. The living area opens out to the granite marble patio, dotted with loungers, and the large infinity pool. There's also a pool table and table tennis table, as well as plenty of cushioned seating spots in the sun or the shade. Beautiful plants and flowers only heighten this outdoor space's tranquillity. Back inside, the five gorgeous bedrooms each have an en-suite bathroom, sea-view balcony and are all modern with white linen, wood furnishings and subtle pops of colour in the pastel pained walls. The master bedroom perhaps steals the show with is glamourous free-standing Jacuzzi bathtub overlooking the bay, while the fitness room with its indoor Jacuzzi tub too comes close runner up. Villa Onluk is conveniently located near the vibrant Kalkan town centre but is away from the busyness in a quiet and secluded spot. For when you'd like to go exploring, the Insta-worthy architecture, fabulous shopping facilities and charming roof-top restaurants that this historic city is famous for are all within easy reach – simply make the short flip-flopped amble down the hillside. Note:Some of the photos may be of the neighbouring Villa Piranta, both villas are the same style and design. Villa Onluk is on the hillside overlooking Kalkan town and the coast. Ideal for relaxing or exploring, it's in a quiet spot and is only a short walk from the town's centre. There you'll find a beautiful boat-lined harbour, sandy beaches and colourful markets selling everything from hand-crafted traditional Turkish rugs to fresh produce, jewellery and leather goods – perfect for picking up souvenirs. Kalkan sits on a curving bay and has plenty of waterfront cafes and restaurants serving both traditional and international cuisine. Spend afternoons exploring the narrow streets and then stop for a cold coffee or tasty lunch while enjoying breath-taking views of the coastline. To experience Kalkan from another perspective, you could jump on a traditional Turkish boat from the harbour and take a trip around the bay, stopping off for swimming and snorkelling in the crystal-clear waters. Kalkan is also renowned for its sandy beaches and there are more options for swimming and snorkelling. Sheltered Kaputas Beach and Patara Beach, a long stretch of shoreline that's also a National Park are both excellent choices. With day beach clubs at both, you can relax on the sand, take part in water sports like kayaking and parasailing or eat at the restaurants. By boat or kayak, you could also visit Kekova island where you can explore the part-sunken ruins of Dolchiste, an ancient town which was destroyed by an earthquake during the 2nd century. Boats usually leave from Kas, a lively town which is a 30-minute drive from Kalkan. Kas also has the impressive ancient site of Antiphellos, with still-visible ruins including a theatre. For more fun day trips, you could head to the seaside resort town of Fethiye, a one-hour drive from Kalkan. It has plenty of top-notch restaurants, shops and fascinating cultural sites too that are well worth a visit.